Advertise with Us and Strengthen Your Web Presence! Having a Web presence for your business is more important than ever! A business, who promotes using social media, gains an edge that makes it easier to reach new customers. It allows them to connect and establish relationships with people they might not otherwise reach. Social media has gone far beyond connecting us with family and friends, and it is capable of building and strengthening communities. "Your competitors are already involved on social media, which means your potential social media traffic and conversions are being poached. Don’t let your competitors reap all the benefits while you stand idly by. If, somehow, your competition is not involved on social media, there’s even more of a reason to get started—the field is open." The average person spends 28 percent of his or her time online on social networks--or 1.72 hours per day. Did you know that there are 3.5 billion Google searches every day, 226 million people in North America login into Facebook each month, and that there are an average of 7,294 Tweets every second? 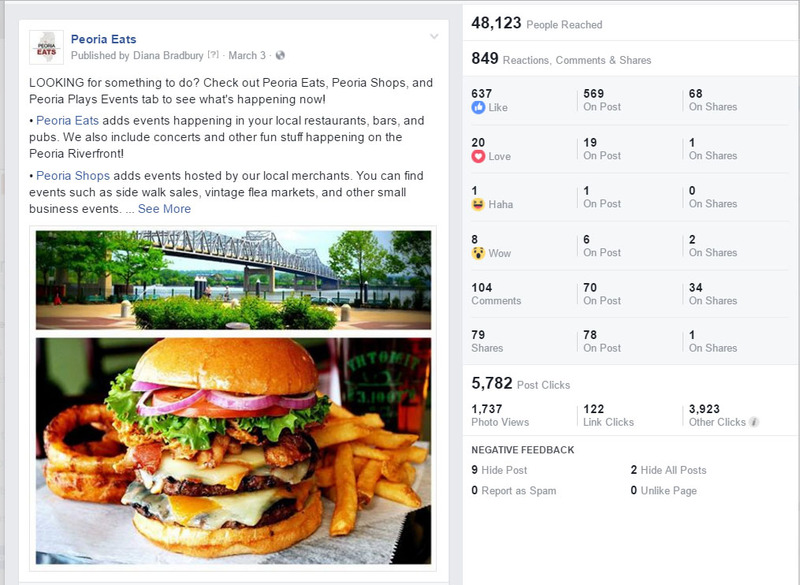 Why Advertise on Peoria Eats Social Media? Peoria Eats started out the new year with a bang by reaching more than 200,000 people in January 2017. We will use our powerful social media platforms to promote your business by sharing your post to our pages. By sharing your Facebook posts we extend your reach and expose your business to new customers. 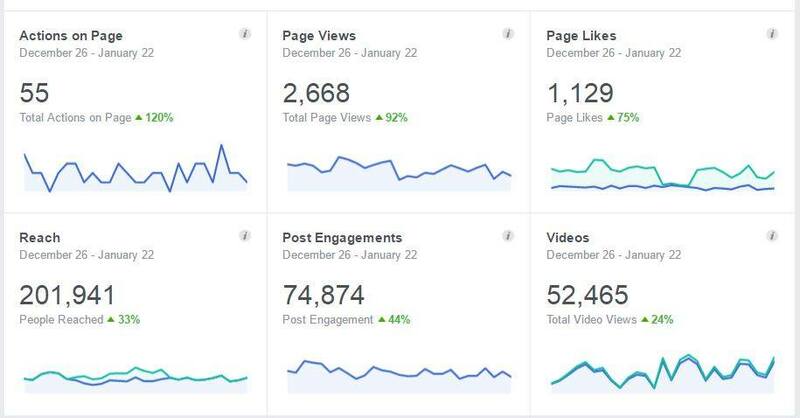 Peoria Eats not only reached 201,941 people, but it received 74,874 post engagements and received 1,129 new page likes in January 2017. Peoria Eats will add your upcoming events to our events page. We will then run targeted advertising to reach an audience within 50 miles of your event. This advertising will provide a continual stream of new constomers to the Events page. The following image shows the results of the advertisement run in the month of March. The advertisement reached 48,123 people, received 849 reactions, 5,782 post clicks and was shared 79 times. Peoria Eats Facebook page has more than 13,500 likes, but more importantly it has more than 13,000 local persons who follow the page. Since we have optimized our page by targeting an audience within 50 miles of Peoria, all of the persons who have liked and follow Peoria Eats are your customers! Peoria Eats is locally owned and operated. Being local will benefit us in maintaining a more accurate and comprehensive list of restaurants and enable us to strengthen our community bonds. Peoria Eats will not only be a place to find a restaurant, but to find out what’s hapening in the Greater Peoria Area. All advertisements will be local to the restaurant listings. PeoriaEats will target advertisements specific to each locations page. This targeted advertising will create a subdirectory on the site of what's happening locally.